Said to have belonged to Rodrigo Borgia, Pope Alexander VI (reigned 1492-1503). Francisco Doctor, Madrid, 1884 (Trinity/Angels); John Edward Taylor, London, before 1897 (enamels in morse setting, as per sticker); (his estate sale, Christie, Manson & Woods, London, 1-4 and 9-10 July 1912, 3rd day, no. 234, as Milanese, c. 1500, attributed to Caradosso); (Duveen Brothers, Inc., London, New York, and Paris); purchased 6 March 1913 by Peter A.B. Widener, Lynnewood Hall, Elkins Park, Pennsylvania; inheritance from Estate of Peter A.B. Widener by gift through power of appointment of Joseph E. Widener, Elkins Park, Pennsylvania; gift 1942 to NGA. This improbable provenance is first mentioned in Catalogue of a Collection of European Enamels from the Earliest Date to the End of the XVII Century, Exh. cat., Burlington Fine Arts Club, London, 1897: 74, no. 242b. Timothy Wilson, keeper of Western art at the Ashmolean Museum of Art and Archaeology, Oxford, wrote to the author [Alison Luchs], 4 July 1990, with documentation newly discovered in the Ashmolean Library (Fortnum papers, box marked South Kensington; copies in NGA curatorial files). The central enamels--the Trinity and ring of angels--of the morse now in Washington were offered for sale by Francisco Doctor of Madrid, in a letter, 6 May 1884, addressed to "Monsieur le Directeur du Musée de Peinture et Beaux-Arts à Londre." The photograph accompanying his letter (fig. 6 in the NGA systematic catalogue entry) showed these enamels resting on a fabric background, without any setting. Doctor's letter and photograph were forwarded to Charles Drury Edward Fortnum, the great collector, connoisseur, and author of catalogues for the South Kensington Museum, who at that time acted as a periodic adviser to the Museum. In a letter to the South Kensington Museum from Madrid, 9 June 1884, Fortnum reported that he had examined the object and that "It is...undoubtedly a work of great excellence; a remarkable example of the Spanish (?) enameller's art of the latter end of the 15 or early XVI century, in [illegible] gold; and in good preservation with the exception of some slight wounds on the arms of the figure of our Saviour and others of minor importance. The work is in very high relief, the flesh coloured to resemble nature as far as possible, the hair and beard of the Eternal Father in gold as is the cross. The mantle is of rich maroon-red translucent enamel, the lining of opaque white. Angels white with mottled wings. It has probably been the central ornament of a pectoral and is the work of an accomplished artist." Fortnum found it a desirable acquisition for the South Kensington Museum, but overpriced at "something above 20,000 francs (£800), and suggested the owner might be persuaded to offer it at a more reasonable price after some time had passed. Thereafter the enamels were evidently sold, provided with their present setting, and acquired for the Taylor Collection before 1897. On Fortnum see Christopher Lloyd, "Two Large Plaquettes from the Collection of C.D.E. Fortnum," Italian Plaquettes (Studies in the History of Art 22; Center for Advanced Study in the Visual Arts Symposium Papers IX), ed. Alison Luchs, Washington, 1989: 207-224. The morse is listed in the 1897 exhibition catalogue (see note 1) as "Lent by Mr. J.E. Taylor." Catalogue of a Collection of European Enamels from the Earliest Date to the End of the XVII Century, Burlington Fine Arts Club, London, 1897, no. 242b, pl. LXIII, as probably German, sixteenth century. Art from the Court of Burgundy, 1364-1419, Musée des Beaux-Arts, Dijon; The Cleveland Museum of Art, 2004-2005, no. 52, repro. The Art of Illumination: The Limbourg Brothers and the Belles Heures of Jean de France, Duc de Berry, The J. Paul Getty Museum, Los Angeles (2008-2009); The Metropolitan Museum of Art, New York, 2010, not in catalogue (shown only in New York). Oro dai Visconti agli Sforza. Smalti e oreficeria nel Ducato di Milano, Museo Diocesano, Milan, 2011-2012, no. 4, repro. The enamel work is in excellent condition. There are a few small losses on the body of Christ (torso, arms, and legs) and on the oak leaf wreath of the setting. Glue residue on the dove's tail suggests that the bird was once glued in place. The figure of God the Father is secured within the surrounding ring of blue clouds by three small pins projecting from his back and passing through small, flat, unenameled gold tabs that extend from the back of the cloud ring toward the center. His hands, made separately, are attached by rolled metal sheets (evidently continuations of his cuffs) that pass through the figure and are visible at the back. The cross is attached to the figure of God the Father by two studs, one at the center and one at the feet of Christ, both covered at the back with a substance that may be stick shellac or rosin. Silver bolts through the hands and feet hold the corpus to the cross. The Trinity/Angels group is secured in its late nineteenth-century setting (see note 2) by a fitted, hammered back, soldered onto the front section of the setting and reinforced by pins that pass through the oak-leaf wreath into the back. A thin, fine rim around the outer circumference of the setting is bent back to secure the flat outer plate that covers this hammered back. Soldered to the back of this plate are two parallel gold strips, apparently the remains of a catch (or devised to resemble such remains). At the front the enamel group is secured by several individual thorns in the encircling crown, which are bent forward to serve as hooks. The (later) enamel work on the leaves and branches differs markedly from that of the Trinity/Angels group. The wreath's green and brown enamel is thinner, more mottled, less intense in color, and less evenly applied. The relatively smooth texture of the gold in patches where the enamel has flaked off does not match the pointillé (pounced) surface of areas that have lost enamel in the central group (as in the Corpus). X-ray fluorescence analysis indicated the composition of the gold alloys varies. The cross contains more silver than other gold areas, and also tin, copper, and lead. The flat back of the setting contains minor quantities of silver and traces of copper, while the front contains only traces of both. The same analysis indicated there are no demonstrably modern colorants or additives present in any of the enamel, even on the nineteenth-century oak leaves. Report, 17 April 1987, in NGA conservation laboratory files. Timothy Wilson wrote to the author on 4 July 1990 with documentation newly discovered in the Ashmolean library (Fortnum papers, box marked South Kensington; copies in NGA curatorial files). The central enamels - the Trinity and ring of angels - were offered for sale by Francisco Doctor of Madrid, in a letter of 6 May 1884 addressed to "Monsieur le Directeur du Musée de Peinture et Beaux-Arts à Londre." The photograph accompanying his letter shows these enamels resting on a fabric background, without any setting. Doctor's letter and photograph were forwarded to Charles Drury Edward Fortnum, the great collector, connoisseur, and author of catalogues for the South Kensington Museum, who at that time acted as a periodic adviser to the museum. The museum declined because of the price, "something above 20,000 francs (£800)," according to Fortnum's letter of 9 June 1884. Thereafter the enamels were evidently sold, provided with their present setting, and acquired for the Taylor collection before 1897. The author is grateful to Timothy Wilson for this information and to the Ashmolean Museum for permission to cite the letter and publish the photograph. Catalogue of a Collection of European Enamels from the Earliest Date to the End of the XVII Century. Exh. cat. Burlington Fine Arts Club, London, 1897: no. 242b, pl. LXIII. Swarzenski, Georg. "Insinuationes Divinae Pietatis." Festschrift für Adolf Goldschmidt zum 60. Geburtstag am 15. Januar 1923. Leipzig, 1923: 65-74, especially 69-71. Inventory of the Objects d'Art at Lynnewood Hall, Elkins Park, Pennsylvania, The Estate of the Late P.A.B. Widener. Philadelphia, 1935: 32, as North Italian (Milanese). Kohlaussen, Heinrich. "Gotisches Kunstgewerbe." In Helmut Theodor Bossert, ed. Geschichte des Kunstgewerbes aller Zeiten und Volker. 6 vols. Berlin, 1928-1935, 5 (1932):388, pl. XXI. Works of Art from the Widener Collection. Foreword by David Finley and John Walker. 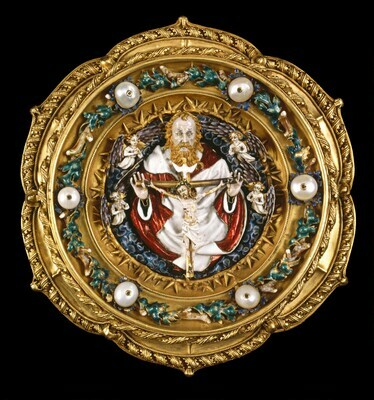 National Gallery of Art, Washington, 1942: 10, as North Italian (Milanese) 16th Century, Morse of wrought gold and enamel. Krautheimer, Richard. "Ghiberti and Master Gusmin." The Art Bulletin 29, no. 1 (January 1947): 33-34, figs. 4, 5. Seymour, Charles. Masterpieces of Sculpture from the National Gallery of Art. Washington and New York, 1949: 12, 172-173, note 9, repro. 40-42. Hartt, Frederick. 'Review: Charles Seymour Jr., Masterpieces of Sculpture from the National Gallery of Art." College Art Journal 10 (Winter 1951): 204. Panofsky, Erwin. "A Parisian Goldsmith's Model of the Early Fifteenth Century." In Otto Goetz, ed. Beiträge für Georg Swarzenski. Chicago and Berlin, 1951: 70-84, especially 80. Christensen, Erwin O. Objects of Medieval Art from the Widener Collection. National Gallery of Art, Washington, D.C., 1952: 25, 28, 31, repro. 29. Müller, Theodor, and Erich Steingräber. "Die französische Goldemailplastik um 1400." Münchner Jahrbuch der bildenden Kunst 3d ser., 5 (1954): 29-79, especially 36, 38, 67-68, no. 5; figs. 9, 62. Steingräber, Erich. Antique Jewelry. New York, 1957: 59-61, fig. 88. Braun-Reichenbacher, Margot. Das Ast- und Laubwerk: Entwicklung, Markmale und Bedeutung einer Spätgotischen Ornamentform. Nuremberg, 1966: 5, repro. 1. Müller, Theodor. Sculpture in the Netherlands, Germany, France and Spain 1400-1500. Baltimore 1966: 21. Richard, R. L. "Trinity, Holy." In New Catholic Encyclopedia. 16 vols. New York, 1967: 14:302, fig. 2. Kohlhaussen, Heinrich. Europäische Kunsthandwerk des Mittelalters. 3 vols. Frankfurt am Main, 1969-1972: 2:xxvi, no. 11. Verdier, Philippe. "La Trinité debout de Champmol." In Etudes d'art français offertes à Charles Sterling. Albert Châtelet and Nicole Reynaud, eds. Paris, 1975: 65-90, especially 69, fig. 48. De Winter, Patrick M. "The Patronage of Philippe le Hardi, Duke of Burgundy (1364-1404)." 5 vols. Ph.D. dissertation, Institute of Fine Arts, New York University, 1976, 1:179. Eikelmann, Renate. "Franko-Flämische Emailplastik des Spätmittelalters." Ph.D. dissertation, Ludwig-Maximilians-Universität, Munich, 1984: 53-54, 380-384, no. 25, 609, 684-686, 814-815, repro. 167. Hackenbroch, Yvonne. "Reinhold Vasters, Goldsmith." Journal of the Metropolitan Museum of Art 19/20 (1986): 169-170; 80, fig. 8. Distelberger, Rudolf, Alison Luchs, Philippe Verdier, and Timonthy H. Wilson. Western Decorative Arts, Part I: Medieval, Renaissance, and Historicizing Styles including Metalwork, Enamels, and Ceramics. The Collections of the National Gallery of Art Systematic Catalogue. Washington, D.C., 1993: 48-53, color repro. 49. George, Philippe. Art et patrimoine en Wallonie des origines à 1789: Essai de synthèse à la lumière des collections américaines et européennes. Namur, 2017: 165, fig. 235.